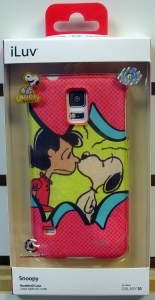 The pink iLuv Snoopy Series Hardshell Case for Galaxy S5 is a hardshell case for your Galaxy S5 featuring an exclusive Snoopy design. The case provides a sleek, customized fit with direct access to all of the controls on the Galaxy S5. Showcased is a whimsical graphic featuring Snoopy and Lucy, letting anyone who crosses your path know you're a dedicated Peanuts fan.